(York, Pa., June 1, 2018) - York Revolution left-handed pitcher Ross Detwiler’s contract has been purchased by the Seattle Mariners organization. 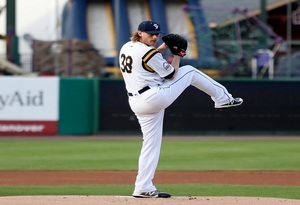 Detwiler will report to Triple-A Tacoma. Detwiler, 32, signed with York in mid-March and made six starts for the Revs, going 3-1 with a 2.70 ERA over 30.0 innings of work. He struck out 32 batters and walked just eight, and opponents batted .254 against him. He is currently tied for second in the Atlantic League in wins, tied for second in strikeouts, and ninth in ERA.